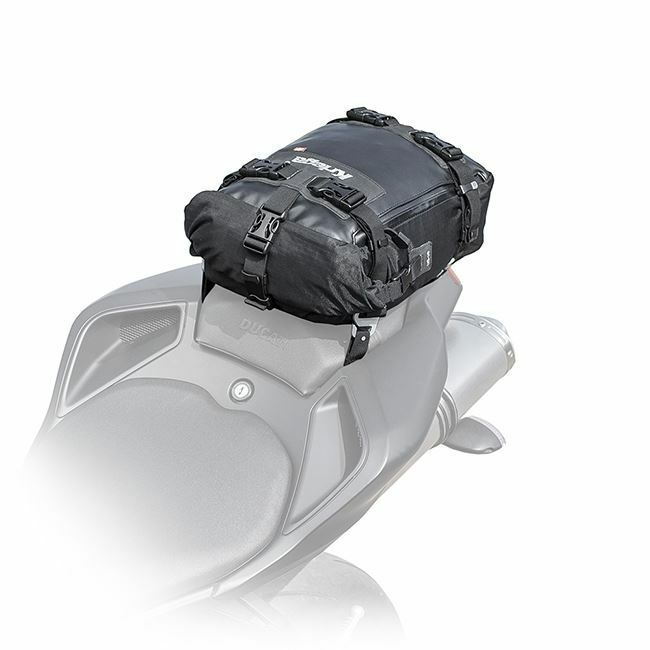 The Kriega US-10 is an award-winning, high quality piece of motorcycle luggage, offering 10 litres of capacity. Like all Kriega US bags, it is a 100% waterproof Drypack with innovative design which attaches to the sub-frame, via included buckle loops and Alloy Hook Straps, for use as a motorcycle tail pack. It can also be used as a tank bag or in combination with other US packs to create a supremely adaptable, modular, soft luggage system. Like the US-5, the US-10 can also be attached to any Kriega motorcycle backpack (Hydro-3, R15, R20, R25, R30 and R35) to increase capacity by 10 litres. The Kriega US-10 is a unique piece of motorcycle luggage is designed to fit most race-rep style seat pads (attachment straps included).The pack is easily attached / removed by 4 quick-release buckles. No extra bungees or covers are needed. It can be combined with other Kriega motorcycle tail packs in various configurations to suit your motorcycle and type of riding. The base of the Kriega US-10 tail pack has an anti-slip coated-mesh pocket for storage of D-locks / chains etc. For use as a tank bag, Kriega US Tank Adaptor must be purchased.